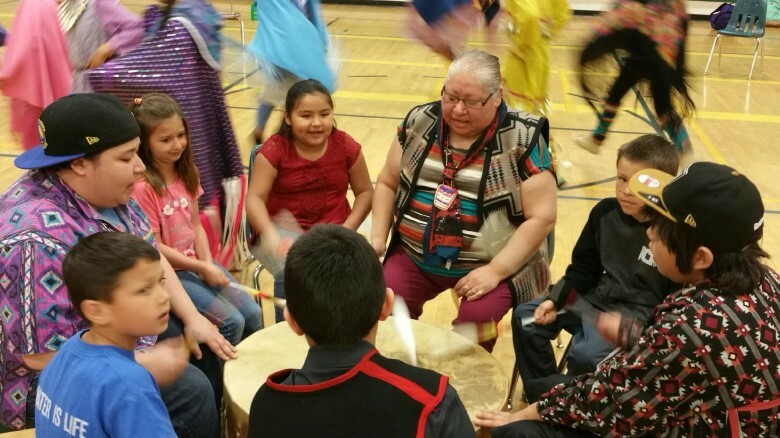 In 2015, Washington became the second state (after Montana) to require Native American Studies as part of a public school education, but offered few resources toward delivering a tribal curriculum. Virginia Grainger Elementary School teacher Marilou Baker had an idea, however. 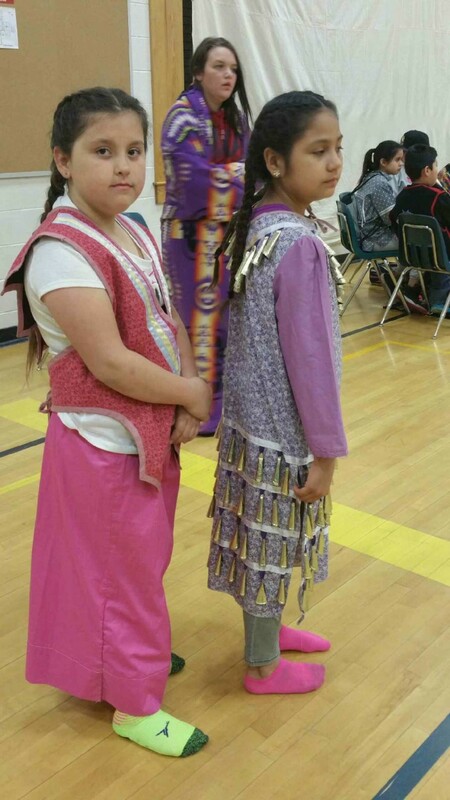 “Because we are located in a small town in a remote pocket of North Central Washington,” says Baker, “our students lack regular opportunities to be exposed to the music and dance forms of other cultures.Although we are located just across the river from the Colville Reservation and just a few miles from the Paschal Sherman Indian School, we have little contact with the Native Americans who live, work, and attend school there.” Why not invite a group of students from the Paschal Sherman Indian School to visit Virginia Grainger students and share with them aspects of their history and culture through music? An invitation was issued and accepted, through Methow Arts’ Artist-in-Residence program. And in April 2017, the Q’uay Kwsa?sus (pronounced Kwigh Ka-sou-ses) –the Blue Sunset Singers–were on their way across the river from the Colville Reservation to Okanogan, where they spent two days sharing traditions of dance, song, regalia, and percussion with all 500 students at Virginia Grainger. 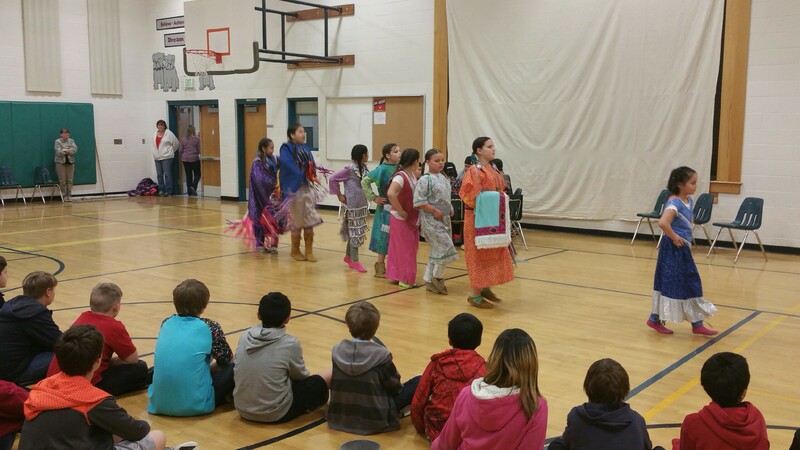 The members of Q’uay Kwsa?sus meet weekly at the school to learn the dancing, drumming, and singing traditions of the twelve bands of peoples that make up the Confederated Tribes of the Colville Reservation. The students, ranging from fifth through ninth grades, are learning the history and techniques of drumming, dancing, and singing. Many are learning the skills from their parents, who learned it from their parents, and so on, as was always the custom until very recent years. Others learned to dance and play the drum through participation in the group, under the direction of teachers Tashina Gorr and Michelle Matt. Whatever the source of instruction, the students’ motives are the same as those of their teachers: for these traditions not to be lost to history. Most of the Blue Sunset Singers wore regalia, which is ceremonial clothing and ornaments worn for performances, pow wows, and other formal gatherings. 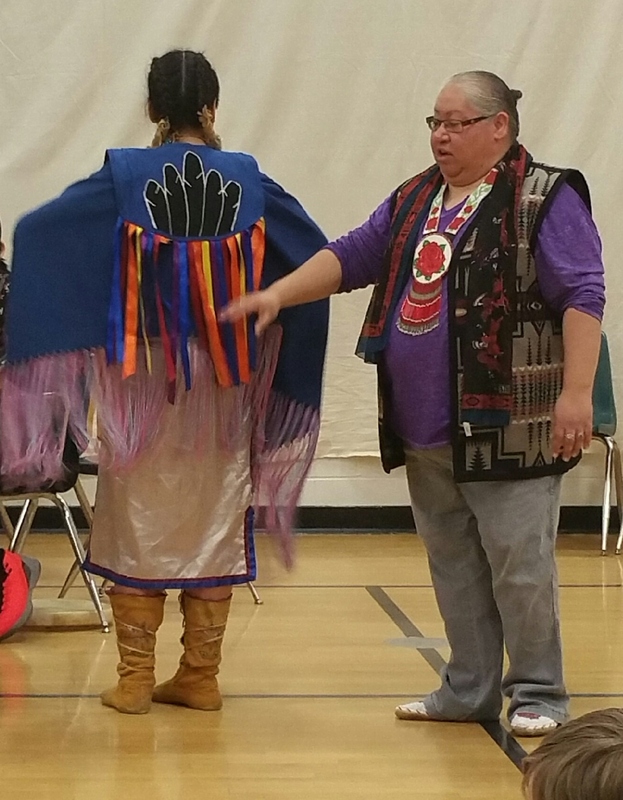 The Okanogan students learned that regalia is not a “costume.” It’s not for actors putting on a pretend show—it’s a sacred and prized possession that reflects the spirit and customs of the people being honored. Regalia is unique to each dancer and is often representational. The girls’ shawls in the fancy dances, for example, represent the opening of a cocoon when a butterfly emerges. The steps of each dance are representational as well, some with a distinctive and delicate toe-heel style of walking in a circle, as if walking on clouds, others with an alternating pattern of the ball of the foot and the whole foot hitting the ground on each step. The Blue Sunset Singers demonstrated both traditional dances (which were held upon return from war or a hunt) and fancy dances (which were developed to preserve Native American culture and religion), as well as a jingle dress dance, which is just like it sounds—a girl dancing dressed in regalia covered with hundreds of little metal cones. And then the Blue Sunset Singers students invited the Okanogan students to join them in an intertribal dance (which is open to everyone), so everyone followed the dancers in a circle around the gym. Meanwhile, six Blue Sunset Singers drummers were busy pounding out rhythms on their giant round drum, which is played on its side (like a cookie, as opposed to a wheel) by drummers with soft mallets sitting in a circle around its perimeter, their feet holding the drum slightly off the ground. 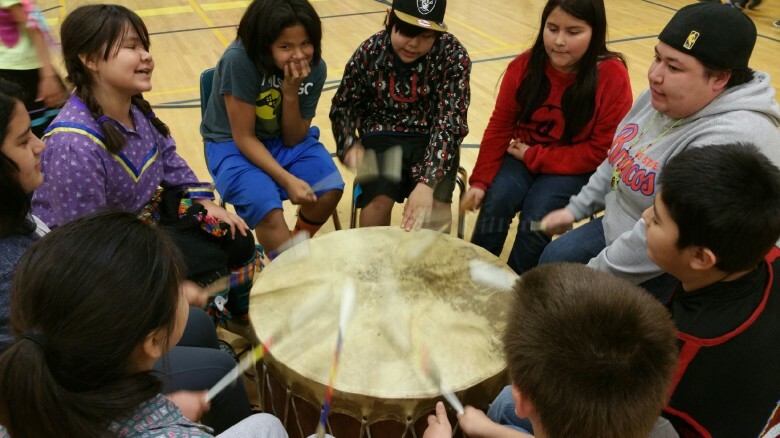 When the Okanogan students got a chance to sit at the round drum and learn a rhythm, they did so eagerly, following the Blue Sunset Singers drummers in their beats and their chants. generally use their native language. Traditional music usually begins with slow and steady beats that grow gradually faster and more emphatic, while various flourishes like drum and rattle tremolos, shouts and accented patterns add variety and signal changes in performance for singers and dancers. The Blue Sunset Singers residency is part of the Music and Movement project, which enhances the existing music program at Virginia Grainger Elementary by understanding music and movement as vital components of Native American creative expression and communication, as well as introducing students to the music, instruments, regalia, and traditional dance forms of local Native American tribes. The residency was sponsored by a Stronger Schools grant through the Community Foundation of North Central Washington, ArtsWA, NEA and the Icicle Fund. Methow Arts Alliance’s Artist-in-Residence program serves 5200 students in the Brewster, Bridgeport, Methow Valley, Okanogan, Omak, and Pateros School Districts as well as the Paschal Sherman Indian School on the Colville Reservation. Most residencies in Okanogan are supported by Okanogan Kiwanis, Okanogan-Omak Rotary, Greg & Mary Hamilton, the Community Foundation of North Central Washington, and ArtsWA, NEA and the Icicle Fund.. 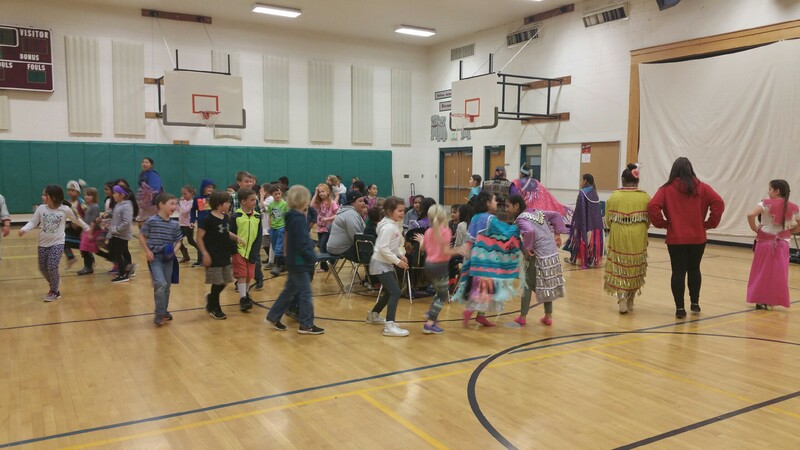 This year’s African Rhythms program was sponsored by a Stronger Schools grant through the Community Foundation of North Central Washington. THANK YOU!